Early yesterday morning, an oil platform sank off the Russian Pacific coast in frigid, stormy waters. The Kolskaya had been stationed off far northeastern Russia, and capsized when engineers were moving the jack-up rig from ongoing drilling projects in the Sea of Okhotsk to the western coast of Sakhalin Island. Accounts from the 14 survivors mention waves in excess of 20 feet. That is enough to flood the operations base and sink the rig. Details are still coming in on how this tragedy occurred. But the question of why is one that deserves reflection this morning. The Kolskaya disaster is a sobering reminder of a growing problem for Russian producers as they push offshore in search of more and more crude supplies. But it is also a warning that tragedies like this will likely occur again if budget shortfalls and company shortcuts continue to intensify in the years ahead. Russia is now the world's largest producer of crude oil. However, as I noted earlier this month, Moscow is moving offshore into very hostile conditions to compensate for accelerating crude oil extraction declines in the traditional production basins of Western Siberia. I have never been on the Kolskaya (“Kola” in English, pictured below), but I have spent time on similar class jack-up rigs. 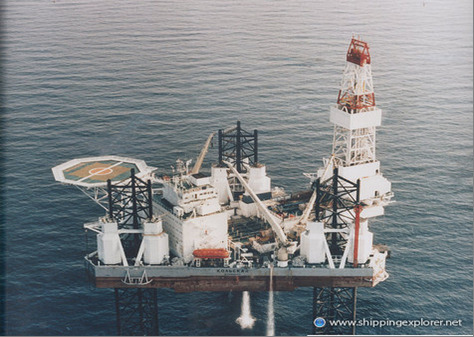 A jack-up is a floating platform resting on movable legs set in a stationary position on the sea floor. The legs can be raised or lowered to compensate for water depths (usually to a maximum of about 400 feet). These are amazing pieces of equipment, with facilities to house more than 100 personnel, and the ability to drill dozens of wells at a time. Once the rig has completed a project, a production platform is towed into place, and the jack up moves on to its next job. And that's what was happening when disaster struck. The Kamchatka Peninsula-Sea of Okhotsk-Sakhalin Island corridor is a prime target area for Russia's offshore expansion. Current production from Sakhalin (which is due north of Hokkaido, Japan) is essential to ongoing crude oil and natural gas extraction figures, with the future demanding even greater volume from continental shelf development. As I noted in early December, we know the vast majority of remaining oil and gas is positioned in offshore waters. Much is both north of the Arctic Circle and under effective Russian control. However, these projects lack sufficient equipment and technology, are incredibly expensive, and are already running well over budget. As with all of the far northern projects I reviewed during my recent trip to Russia, there is a lack of drilling rigs and a multiple-year delay in getting access to available production platforms. Most of the platforms must be ice-resistant and are constructed from scratch. But before any extraction takes place from a platform, the drilling rig needs to complete the well. That means a company needs to get a rig to a new site as soon as one is available. Once a well is drilled, completed, and capped, a production platform is moved in as soon as possible. And sometimes that means that companies decide to tow through a major winter storm to get a drilling rig into position. The Kolskaya had been working at a project operated by state-controlled natural gas giant Gazprom, the same company controlling the Sakhalin 2 project and likely to wrestle operating status at Sakhalin 1 from ExxonMobil Corp. (NYSE: XOM) local subsidiary Exxon Neftegaz. Waiting in the wings is Rosneft – the country's largest oil producer and another state-controlled major. Yet, if budgetary overruns are a problem for private companies under such drilling conditions, they are not any better for state-run ones. In fact, given that shortfalls here must be covered by the government's budget, the financial fallout can be even worse. This leads to taking shortcuts that can have drastic results. Moving rigs in this part of the world means traveling under icy conditions (the nuclear-powered ice breaker Magadan was accompanying the tug moving the Kolskaya). Among the harshest conditions of any place on the globe, winter here commonly lasts eight months each year. However, we shall see the real reason this tragedy occurred as more projects move forward. As the push goes offshore to garner more of the available hydrocarbons, the combination of significant budgetary pressures and the bottlenecks forming in the availability of equipment will drive companies to make mistakes. This is not the first time in recent memory that budgetary constraints have resulted in an offshore disaster. Much of the ultimate blame for the Deepwater Horizon debacle in the Gulf of Mexico last year resulted from decisions made to expedite putting the Maconodo-1 well on line. Then, as with the Kolskaya yesterday, concerns over cost overruns led to a calamity. With moves offshore intensifying worldwide, the problems resulting from the lack of rigs and support technology will simply get worse. As costs increase, so does the pressure to cut corners and avoid further losses. Companies having available rigs adequately equipped to drill in increasingly hostile climates and conditions will be able to charge top dollar. But these costs will continue to rise, having an impact on prices up and down the line. To say nothing of putting an entire government oil and gas drilling strategy in jeopardy. With Russia now the top crude producer in the world (though Saudi Arabia still has, by far, the largest reserves), that could pose an even longer-range upward pricing pressure on crude oil generally in an already shaky market.